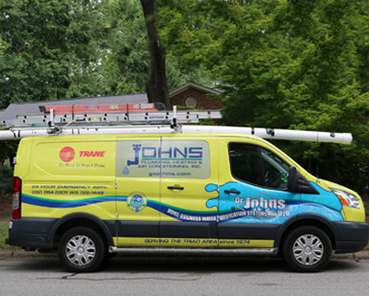 For the best in Triad area plumbing services, choose Johns Plumbing Heating & Air Conditioning. Along with conventional plumbing services, Johns-trained plumbers offer drain and water jet cleaning, backflow prevention, water main replacement, and other specialized plumbing services all across the Triad. Whether yours is a commercial facility, a single family home, or an apartment, no plumbing job is too large or too small. Johns makes every effort to ensure that our work is done in a proper and professional manner. Due to the many variables associated with plumbing, we offer customized warranties specific to the project for our residential and commercial customers. We're happy only if you are happy! If you are looking for trustworthy Greensboro plumbers, contact Johns Plumbing. Be sure to check out the details for our heating and air conditioning services and drain cleaning services. "Just wanted you to know that one of your plumbers (Matt, I believe) and a helper just left my home. They were polite, pleasant and professional, got in and out in a reasonable amount of time and fixed everything I had broken. They were a very positive reflection of the Johns Plumbing brand."